The first draft of a story is just the raw material, right? It will need to be revised, reworked, perhaps even radically overhauled, word by word, plot hole by plot hole. This is the fall back that makes writing a slightly less daunting endeavour. Thankfully everything you put down can later be improved, reordered or deleted. That is the stage I am at now, trying to enhance my novel to the best of my abilities – and there’s a lot more work to do. But once in a while, a writer of genius come along who breaks all the rules, someone like the giant of 19th century English fiction Charles Dickens. Last year being the bicentenary of Dickens’ birth there was a lot of Dickens talk and I happened to hear a radio discussion about the great writer in which one of the experts named Our Mutual Friend as the author’s best book. It had been years since I’d picked up a Dickens novel but he’s always been close to my heart, growing up I did with so many of his child protagonists, the stories read to me by my grandmother, a lifelong Dickens fan. So I got my hands on a copy and tackled the near 800-page opus. At the back I was delighted to discover Dickens’ plot plans and notes included. It’s a fascinating insight into his working method and brain. He had worked out (monthly) number by number how the action would unfold, weaving all the storylines together and leading his characters on a merry dance through to conclusion. Courtesy of Claire Tomalin’s suberb biography – Charles Dickens A Life – which I’m currently reading, I have discovered a lot more about Dickens. From the very beginning Dickens did not have the luxury of letting his stories evolve organically as they were serialised in monthly or weekly issues. Tomlin quotes Dickens as saying: “My friends told me it was a low cheap form of publication, by which I should ruin all my rising hopes”. He triumphantly proved them wrong. 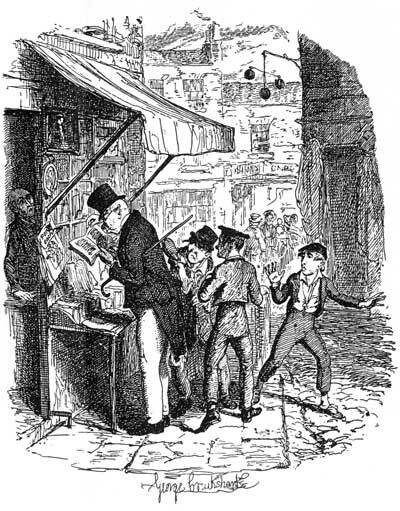 For ten months in 1837 two of his serial stories, The Pickwick Papers and Oliver Twist, ran simultaneously. Dickens was producing the chapters for two different publishers and coordinating with two illustrators – an incredible juggling act, on top of which he was also editing and contributing to a monthly magazine Bentley’s Miscellany. Just four years earlier, aged 21, his first piece of non-journalistic writing was published – a ‘sketch’ or short story, published anonymously and for no fee in a very small circulation magazine called the Monthly. He remembered dropped in his offering “stealthily one evening at twilight” after the place had closed. The sketch was followed by many more and led to fame within months and a 30-year stellar career. We cannot watch fly-on-the-wall documentaries about life in Victorian England but we do have Dickens, who transposed so many of the characters and everyday scenes around him into his work. The people loved him for his crusade against the appalling social injustice of the day and we still have the privilege of learning from the great master of storytelling. This is a great blog post, very interesting. Thanks for sharing! I’m thinking about attempting Dickens as my next read. I was forced to read Oliver Twist when I was young for school and remember hating it, but I think that was probably more due to the circumstance than the writing. I hope. I’ve seen a lot of Dickens adaptions so I thought it was about time I started reading some of the books! I can’t even imagine how hard it must of been for him to work that way, I knew this was how his stories were published but hadn’t given it much thought until now. I would go crazy with deadlines that tight! It’s really quite amazing. on Blogs of a Bookaholic. The one upsetting thing I find about this article, is that I’ve found yet *another! * interesting life I want to follow! I’ve always been more of a poet-groupie, but …..god I hate you right now for introducing me to Dickens properly, because my list of life stories has just gone up. I need an I.V drip of Red Bull…..I want to read all the things I’ve been meaning to read tonight!